On the sliding scale of tortured souls, your average reactive dog owner lands somewhere between Sisyphus and victims of the more creative members of the Spanish Inquisition. Like all humans, owners of fearful, aggressive, reactive dogs want to make their lives easier. This has given rise to a whole category of pet products marketed for behavior modification. I must have spent hundreds of dollars on such products in the last few years; when I first got my reactive dog Edie, any snake oil salesman could have pitched up at my door and found a goldmine. Handling a dog that lunges is one of the most physically tiring and emotionally draining parts of being outside with our reactive dogs. This is why there are hundreds of different kinds of walking equipment, all marketed as the best solution for a dog that pulls. In fact, none of these fancy harnesses can literally stop a dog from pulling; it's what they do when a dog does pull that makes the difference. With a dog that forges ahead like a steam train, or suddenly lunges at other dogs, it's tempting to opt for a corrective collar, like a prong or a slip. Behavioral science tells us, however, that those sorts of devices are more likely to make the reactivity worse, not better. So a well-fitted harness and good, thick leash is the best combination of controllability without corrections. 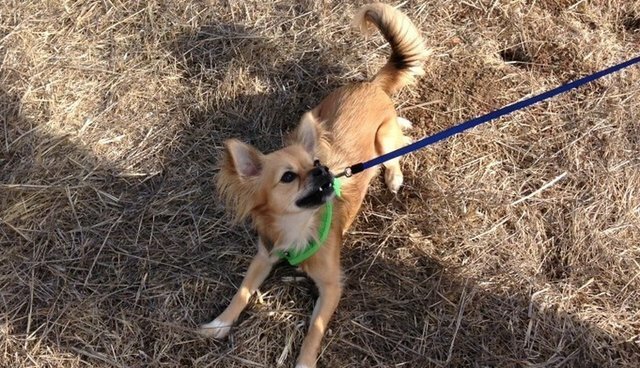 And of course, for dog's sake, don't use a retractable leash around other dogs or humans! Remember Felix the Cat's bottomless bag? That's the sort of thing you'll need for walking your reactive dog. Some people use tool belts, others have military-grade gilets that make them more pocket than person - my personal favorite is a rather stylish fanny pack designed for ultra-paranoid tourists - whatever you choose, make sure it can fit more treats than you think you need. And then put some more treats in there. You'll need them. Positive reinforcement really is the best way to help a dog cope with the things that upset him in his environment; using protocols called "counter-conditioning" and "desensitization" can teach your dog that it's fine to ignore that person, dog, out-of-place trash can, or anything else that causes his reactive outbursts. Treats are a must for these protocols to work, so don't be stingy. More information is available from the CARE website. You can't be everywhere at once, but your dog probably can. Unless you live at the top of a mountain, and are eagerly awaiting the day your groceries are delivered by drone, at some point you're going to have someone come to the door. And you're going to have to open it. Worse still, you may even have to invite them in! I don't know about you, but my relatives are not the most compliant people on the planet. It doesn't matter how many times I tell them not to stare at, reach towards, or otherwise annoy my reactive dog, at some point they're going to do it anyway. So, to protect them, my dog, and my own sanity, I use an ex-pen. When the takeout guy arrives, the ex-pen goes around the door. When I have guests, I can separate their half of the room from the dog's. A crate would serve this purpose just as well, so long as your dog doesn't see it as a punishment. Just having people in their space is bad enough for many reactive dogs, without the added insult of being put in a time-out. Make the crate a wonderful place to be, however, with something to chew and a soft place to doze, and maybe having guests over won't seem so bad. Maybe your dog is a superstar at the vet, but mine is not. A trip to the vet is about as fun for my dog as a trip to the emergency room in Tajikistan would be for me. Being babbled at in a language I can't understand whilst being poked and prodded is not my idea of a good time, but we expect our dogs to deal with it like a Stoic. Mostly they do, but sometimes, they can't, so they communicate in the only way they know will be listened to: aggression. This is partly because of something behaviorists call "trigger stacking"; my dog might be able to cope with one person, or being in a strange place, or being near a dog, but the combination of people and a strange place and a nearby dog is just too much. When dogs are stressed, they can be unpredictable, which is why my dog is muzzled whenever we go to the vet - or anywhere else she might suffer from trigger stacking or get herself in trouble. There's no shame in muzzling your dog, it just means you care about him, and about other people's safety. See the Muzzle Up! Project website for information about how to teach your dog that muzzles are fantastic. Okay, so you can't buy patience, but you can build it. And unfortunately, patience is something you're going to need a great deal of with a reactive dog. Even if you could spend every hour of every day working on counter-conditioning and desensitization, every dog will progress at his own pace. In fact, behaviorists agree that these treatments work best in short bursts with some time between them, so no matter how dedicated you are, you're going to have to wait to see progress. Patience is a lot easier to build when you have a goal in mind, and when you believe the goal can be reached - ever tried waiting for something that might happen? Much more infuriating than waiting for something that will happen! The best way to develop the patience you is to work with a professional trainer, behaviorist, and/or veterinary behaviorist. You can use their experience in seeing results to help you believe that things will get better, and you can use their expertise in helping reactive dogs to break your goals down into manageable, realistic mini-challenges. And, of course, to remember that neither you nor your dog is enjoying being in this kind of stressful situation. You're learning from each other in a very pressured, intense situation, and it's natural that both of you are going to get frustrated. Just as you're trying to help your dog feel better, you have to remember to help yourself too. But what about.....? I heard it was great! The number of different products aimed at improving "behavior" in dogs probably runs into the thousands. There's everything from compression shirts to pheromone sprays, herbs and homeopathics, soothing music...the list is endless. The reason I haven't included any of these in the list is that although some of them might have a small effect on some dogs, none of them are likely to really fix the underlying issues your dog is having. There's no harm (other than financial!) in trying these things, but they're not a substitute for proper management and behavior modification.